A fellow art card trader asked me to draw her parrot. Her name is Miss Duke (the parrot) and she looked like a charmer from the photo I received. It was fun figuring out what colors to use. Oh and look, no pen lines! Thanks Amy. I’m glad you like it. I was so excited when I finished this. Thanks Sue. I think your watercolors are lovely. Beautiful colours Mellanie. Love that violety background. I had a go with coloured pencils myself the other day but it was very disappointing..
Oh Cathy, I wouldn’t worry about the colored pencils. You do lovely digital work, which I like very much! Thanks for stopping by. 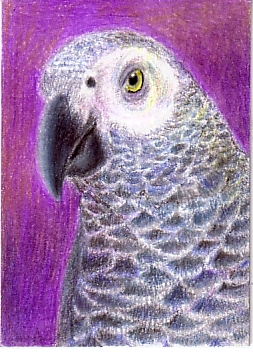 Pingback: Another Parrot ATC: Meet Shadow « See. Draw. Share.